While it is quite a bit of fun, it suffers from the limits of Sherlock Holmes tales. Made for fans of Ritchie, Downey Jr., and fast-paced action films. Rated PG-13 some violence and language. Sherlock Holmes stories have never been that impressive to me. They always seem to follow that same formula were something sinisterly supernatural is afoot. Holmes has always used logic to explain away the paranormal, and always ended up exposing the other-worldly happenings as parlor tricks and illusions. For better or worse, Holmes stories always ended exactly the same as ‘Scooby Doo’ mysteries, only without all the wacky hijinks. The Holmes I remember as a kid reading “Hound of the Baskervilles,” was that of a reserved, soft spoken man who hid his real thoughts about the case until the very last possible moment. Here Guy Ritchie and Robert Downey Jr. have created a Holmes that acts more like a high functioning autistic. In this highly stylized and super-frantic version of ‘Sherlock Holmes,’ Holmes suffers from over stimulation, self-loathing, and a dash of extra Downey Jr. cockiness to keep things entertaining. Do you ever remember Holmes taking on attackers with karate moves? Well, after seeing this film you may never think of the legendary detective the same way again. Ritche’s Holmes is a neurotic mess of a man, who revels in fighting. No worries though, because even in the quick-cutting, fast action scenes, we still get a heavy helping of Holmes’ deductive reasoning on where and when to exactly strike his opponent. Holmes and Watson (Jude Law) find themselves embroiled in a dastardly masterpiece of crime when Lord Blackwood (Andy Garcia) has gone on a killing spree. Holmes stops him before he kills his last victim, Blackwood is sent to jail to be hanged. After his execution Blackwood rises from the grave to bring vengeance on those that have wronged him. Again, if we know anything of original Holmes detective tales we know what must happen and how Holmes will put it all together with his observation techniques. Since we know what to expect, it’s how it is portrayed that is the real treat here. 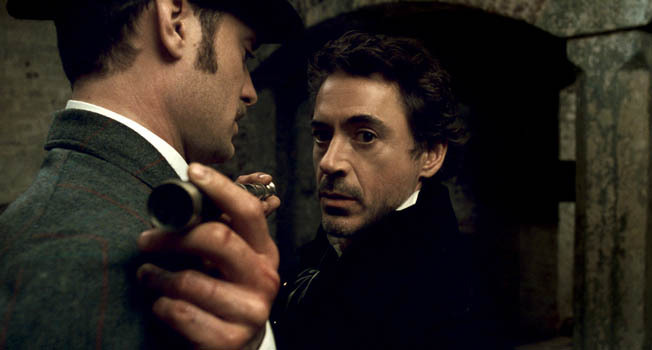 Downey Jr.’s slightly off-center portrayal of Holmes is a fantastic little piece of acting. Holmes and Watson bicker like an old married couple, instead of the well put together duo that I remember when I was a kid. Ritchie has definitely given the legendary story a facelift for a new century, and it works to a degree, although the Holmes story has always been encumbered by its own formula. Even though this is a departure from Ritchie and his normal hip gangster fare, you can still feel his directorial influence felt within. The action scenes are cut with nauseating speed, lingering on a shot no longer than a second. It’s a good thing that we see slow motion how-to videos right before the actual beatings take place or we wouldn’t know what was going on at all. The dialogue here is just as fast-paced, and at times, just as hard to understand. Downey Jr. and Law deliver their lines with such velocity and ferocity that it’s easy to miss lines here and there. The writing, though, contains that all too familiar Ritchie wit that populates his other films. This Sherlock Holmes isn’t the one you remember from your younger days. It is a new (some may say improved) Holmes with more of a penchant for fighting than for solving riddles. It’s a fun ride, but ultimately doesn’t amount to much more than a hyper-stylized ‘Scooby Doo’ ghostly mystery.